The primary goal of any welding operation is to you use a gas as a covering shield around the arc to make a weld that has the same properties as the base prevent the atmosphere from contaminating the weld. metal. The only way to produce such-a weld is to protect Gas shielding makes it possible to weld metals that are the molten puddle from the atmosphere. In gas otherwise impractical or difficult to weld by eliminating shielded-arc welding, briefly discussed in chapter 3, atmospheric contamination from the molten puddle. 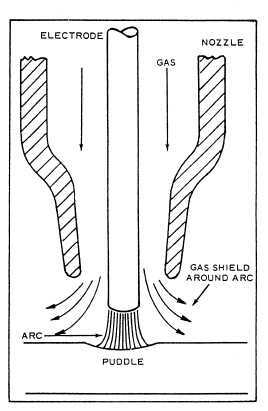 Figure 8-1 shows the basic principle of gas shielded-arc welding. The two general types of gas shielded-arc welding processes are gas tungsten-arc welding (GTA) and gas metal-arc welding (GMA). GTA is often tilled TIG (tungsten inert gas) and GMA is referred to as MIG (metal inert gas). The term inert refers to a gas that will not combine chemically with other elements. Gas tungsten-arc welding is basically a form of arc welding; however, in gas tungsten-arc welding, the elec- trode is used only to create the arc. The electrode is not consumed in the weld as in the shielded metal-arc process. The gas tungsten-arc welding process generally produces welds that are far superior to those produced by metallic arc welding electrodes. Especially useful for welding aluminum, it also may be used for welding many other types of metals. The GTA process is most effective for joining metals up to 1/8 inch thick, although you can use it to weld thicker material. Figure 8-1. - Gas shielded-arc welding principle. Figure 8-2. - GTA welding process.